Rights group Karapatan on Thursday called on the Aquino administration for transparent and credible process in the selection of the members of the Human Rights Victims Claims Board. “The process should be acceptable to the victims,” Karapatan secretary general Cristina Palabay said. Palabay said they are apprehensive because as vital information on the nomination process and schedules were not publicized. 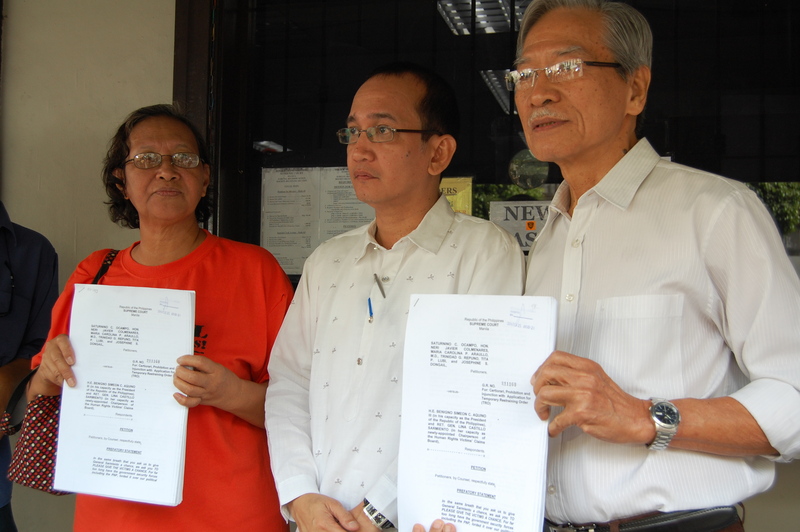 “We hope that this is not a foreshadowing of the possible exclusion of the nominees of Selda and Tanggol Bayi from the Human Rights Claims Board,” Palabay added. Under Republic Act 10368 or the Human Rights Violation Victims Reparation and Recognition Act of 2013, the Claims board is mandated to formulate the implementing rules and regulations of the measure and to process the claims of victims of human rights violations during martial law. SAYING the quest for justice is not yet over, President Aquino yesterday signed the Human Rights Victims Reparation and Recognition Act of 2013 (Republic Act 10368), which would compensate human rights victims during the martial law era. The law, which was signed during the 27th anniversary of the EDSA People Power revolution, sets aside P10 billion from the seized Marcos assets as reparation for victims of summary execution, torture, enforced or involuntary disappearance and other gross human rights violation committed from September 21, 1972 to February 25, 1986. The law also concluded that members of the class suit that was decided by Hawaii District Court Judge Manuel Real and human rights victims as recognized by the Bantayog ng mga Bayani Foundation are also presumed victims during the martial law regime. Presidential spokesman Edwin Lacierda said Section 20 of the new law provides for a reward or point system ranging from 1 to 10 which would be used to identify the victims and determine how much compensation they would receive. Those who died or disappeared or are still missing get 10 points; those tortured and/or raped, four to nine points; detained, two to four points; and forced into exile, kidnapped or otherwise exploited, sexually offended but not raped during military and/or police operations, one to four points. Claims by the human rights victims or their heirs shall be made within six months after the effectivity of the implementing rules . The law provides that no special power of attorney shall be recognized unless the victim is incapacitated. A nine-member Human Rights Victim’s Claims Board shall be created that would draft the implementing guidelines and process the applications for compensation. Non-monetary reparation shall be provided by the education and social welfare departments, Commission on Higher Education and the Technical Education and Skills Development Authority in coordination with the Commission on Human Rights, through the preparation of teaching modules on the abuses committed and heroism shown during the martial law years. A Human Rights Violations Victims’ Memorial Commission shall be established in honor of the human rights victims. Aquino said the People Power revolution does not belong to only one particular group, and called on Filipinos to remember its lessons and put the country’s interests ahead of their own. He said a united and solid Filipino force is needed to stand against all obstacles in the path towards progress. The President said the Philippines served as inspiration for other countries after the 1986 bloodless revolution. He said the country is again a new source of inspiration due to its strong fiscal standing amidst the global economic uncertainty and pessimism. He said Filipinos should be proud of this achievement, and work on ending the economy’s boom and bust cycle. Aquino led the flag raising ceremony at the People Power Monument that kicked off the day-long activities that marked the Edsa anniversary. The President was joined by Vice President Jejomar Binay, Cabinet members led by Executive Secretary Paquito Ochoa Jr., and members of the Senate and House represented by Senator Franklin Drilon and Speaker Feliciano Belmonte Jr. The President also led the awarding of the Spirit of Edsa Foundation Awards, and witnessed the presentation of a Pledge of Commitment by governors, and religious, business and youth representatives and the “Salubungan” rites that recalled the converging of the military and the people in EDSA to stand against the forces of then President Ferdinand Marcos. President Fidel Ramos, then AFP Vice Chief of Staff, and former Senator Agapito Aquino – Aquino’s uncle – led the Salubungan. A statue of Our Lady, credited for the peaceful revolution, was carried by Father Arnold Abelardo who was seated on top of a military tank adorned by yellow flowers. The Salubungan was followed by a shower of yellow confetti from a military chopper. The Madrigal Singers then led the singing of “Magkaisa” and “Bayan Ko,” after which Ramos and the elder Aquino reenacted the “victory jump,” a reminder of the crowd’s celebration when told that Marcos had left the Palace. In the afternoon in Malacañang, the President met with busloads of children from various orphanages and told them about martial law and People Power. He said the younger generation should preserve the democracy and freedom that the country enjoys. The Samahan ng Ex-Detainees Laban sa Detensyon at Aresto (SELDA) said the signing of the reparations law was a “small victory” for the martial victims’ continuing search for justice. “They faced adversity, but took the courage to stand up and defend, not only theirs, but the people’s rights,” said SELDA chair Marie Hilao-Enriquez. The group said the passage of the law was due mainly to the persistence of the martial law victims who worked with supporters against those who sought to oppose or delay the measure. SELDA vowed to guard the 9,539 people included in the master list of martial victims against unnecessary bureaucratic processes and scams that will deprive them of just indemnification. 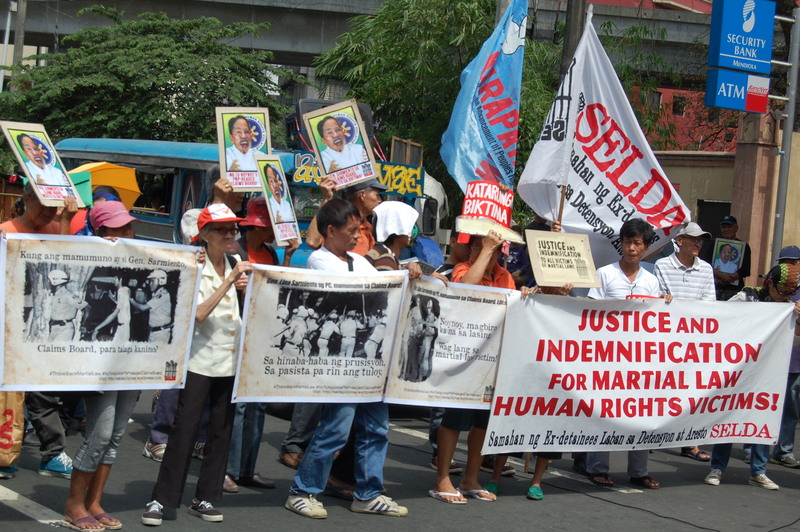 The human rights group Karapatan said the human rights abuses continue under the present administration. The militant group Bagong Alyansang Makabayan (Bayan) said the political comeback of the Marcoses, 27 years after EDSA 1, points to the failure of all post-EDSA governments to make them truly accountable.